Home › News › And then there were ten! We were delighted to receive the news on 14 April 2015 that Councillor Hanna Zuchowska (Liberal Democrat, Wandle Valley) had added her support to Space for Cycling in Sutton. Along with Councillor Manuel Abellan (Liberal Democrat, Beddington South), who declared his support on 29 March 2015, this takes the total number of councillors in the borough who have the “cycling vibe” to ten. Welcome Manuel, welcome Hanna, and thank you! Manuel and Hanna’s support can only help boost the profile of cycling in Sutton, and it is hoped that more councillors will follow their lead. Especially so, given the confirmation at the Environment and Neighbourhood Committee meeting on the 19 March 2015 that the council intends to commission a new borough Cycling Delivery Strategy to support the new Sustainable Transport Strategy. Manuel’s support last month resulted in Beddington South becoming the first ward in Sutton to have support from all of its elected councillors. Now with Hanna’s support, five of the six Local Committee areas in Sutton have a least one councillor who is effectively a “cycling ambassador”. Only Cheam North and Worcester Park Local Committee, comprising Nonsuch, Stonecot and Worcester Park wards, currently remains with no representation. In representing their ward, and the people who live in it, all of our councillors have to work hard to balance the needs and interests of their local area, their residents, their voters, local businesses, their political party (if they belong to one) and the council. Balancing the different roles of being a councillor makes a considerable demand on their time, and there is little doubt that all councillors contribute greatly, in one way or another, to the benefit of the community they represent. As democratically elected local representatives, councillors have a unique and privileged position. Their decisions can make a real difference to people’s lives, and these decisions (usually taken in partnership with council officers) can have an impact that lasts for many years to come. That is why it is important to look beyond what matters right here, right now, and to take a strategic approach that considers the longer term. And it is also why it is important to take what are sometimes seen as difficult and challenging decisions, rather than just giving a passing nod at what, in the short term, is seen as the easiest, the accepted, the tried, and the trusted option. Space for Cycling is not just about taking steps to make a people-friendly form of transport a safe and attractive choice. It is about what we want Sutton be like as a place to live in ten, twenty years time. It’s about how healthy and content our population will be. Ask most people if they would like to live somewhere where their children would be able to cycle or walk to school, or where, in their late retirement, they would have the confidence to ride a bicycle to the shops or to the park as part of some regular, gentle, exercise, the answer would almost certainly be yes. Ask people if they would like to live somewhere where the streets were not congested with traffic, where the air quality was good, and where shops and restaurants thrived, again, it would be a resounding yes. Making Space for Cycling has the potential to make Sutton an even better place. It is going to be challenging at times, and it is going to take time. But it will be great pity if there is lack of progress now simply because too much emphasis is placed on whether we will be able to park our cars conveniently outside our children’s school next Monday morning. 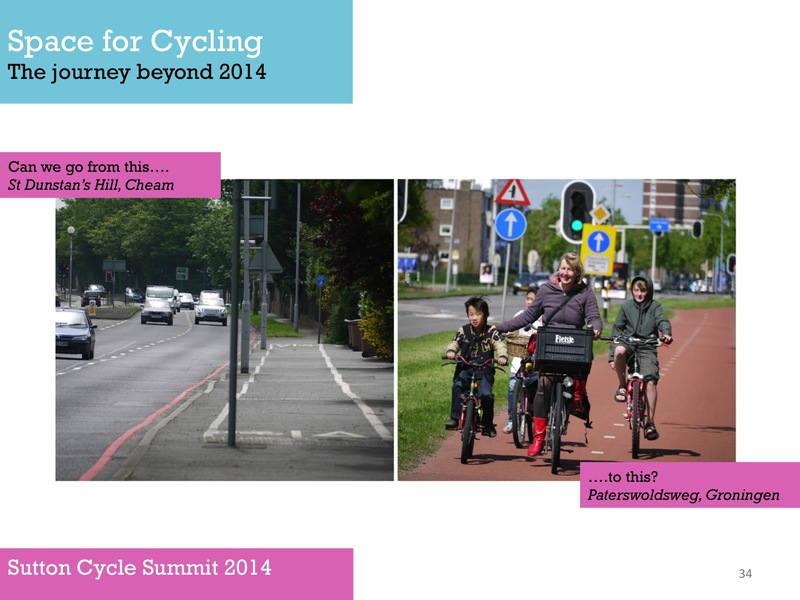 The ten councillors in Sutton who have so far shown their support to Space for Cycling have taken the lead on this. Especially so, given that cycling is not something that has historically been high on the agenda in this borough or, unsurprisingly, something that most people living in the borough do. (The proportion of Sutton’s residents (16+) who cycled three, or more, times a week (for any length or purpose) in 2012/2013 was 2.0%, compared to 5.4% for London as a whole, and 4.3% for England [Active People Survey: DfT, Walking and Cycling Statistics, Table CW0111]). There is, nevertheless, some evidence to suggest that many of Sutton’s residents would like to cycle provided the conditions were right. (A small scale survey in Carshalton in 2012 [Sutton Living Streets/Cyclism; unpublished] found that around 82% of the respondents who did not cycle at the time would consider doing so if the conditions were right). So, if Sutton ultimately becomes a place where utility cycling and walking, along with active and healthy lifestyles, are commonplace, it may well be traced back to the decision that these ten individuals made during the last twelve months (provided, of course, that they act upon it). On the other hand, if Sutton remains an uninviting place to cycle, then, despite whatever good the other 43 councillors do in office between now and 2018, future residents may well ask why these councillors did not help to start to improve transport options and choices when they had the opportunity to do so. Future residents may also question whether 2015 really was the year that the council published another Sustainable Transport Strategy and declared (possibly not for the first time) that “Sutton aims to become London’s most sustainable suburb”. If you are a councillor and have not yet registered your support for Space for Cycling in your ward but would like to know more, there is background information on the Councillors page of the London Cycling Campaign’s website. We will always be pleased to hear from you too. Contact details can be found on our Get Sutton Cycling About page. 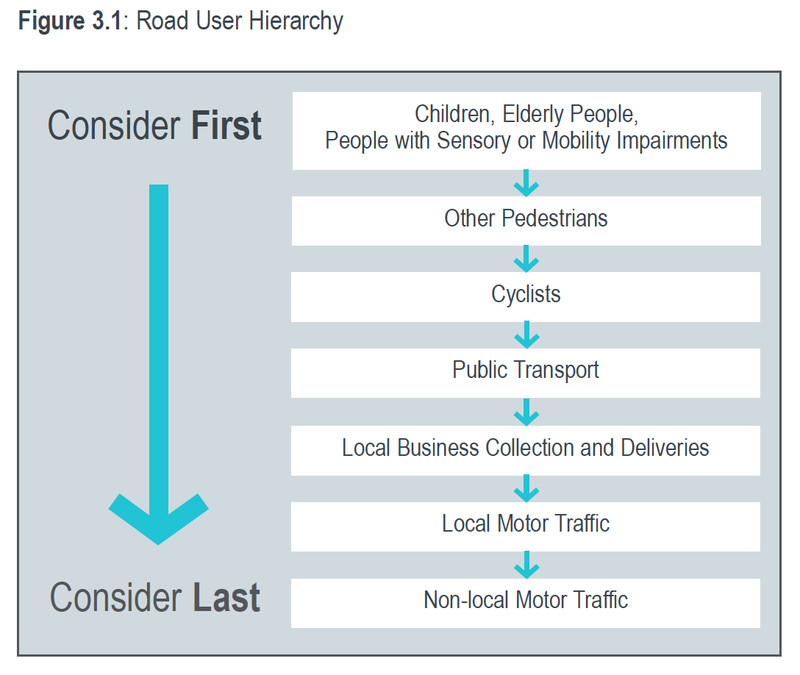 Road User Hierarchy: extract from Sutton Council’s Sustainable Transport Strategy (March 2015), and referenced in paragraph 3.5: “In order to support the transport vision the council supports a ‘modal hierarchy’ which puts sustainable modes of transport above less sustainable modes and prioritises road users accordingly. The hierarchy is set out in Figure 3.1, and will be used to inform transport scheme selection and design and influence the priority given to each of these modes”. Quite how this ‘modal hierarchy’ will be achieved, without providing the interventions proposed as part of Space for Cycling, is unclear. [i] Sutton Council approved the draft Sustainable Transport Strategy (October 2014), with the welcomed addition to commission a Cycling Delivery Strategy, at the Environment and Neighbourhood Committee Meeting held on 19 March 2015. The final document does not yet appear to have been made available on the council’s website (as of 24 April 2015) . However, Agenda Item 5 documentation available on the Environment and Neighbourhood Committee agenda items page for 19 March 2015 (see link to “Sustainable Transport Strategy”) includes the text of the approved strategy document. In our response to the consultation on the draft strategy in January 2015, we suggested that the final document needed to be placed prominently in the public domain. Specifically, we recommended that sustainable transport be featured in all correspondence sent by Sutton Council to residents in the borough, and suggested that the home page of the council’s website would be a good place to display the road user hierarchy. [ii] Get Sutton Cycling had expected to receive a review of our Space for Cycling ‘ward asks’ from council officers by late October, early November 2014 (see notes from our November 2014 meeting for more on this). Had this review been received, we may possibly have now been in a better position to understand why so few councillors have given their support to the proposals (or, at the very least, why so few councillors have expressed some sort of interest in them). The majority of newly elected councillors were presented with a printed copy of “Space for cycling: action points for Sutton” at various Local Committee meetings during the late spring, early summer 2014. [iii] We understand that Sutton Council appointed consultants in March 2015 to produce the draft Cycling Strategy, and that this is to go to public consultation at the end of April 2015. Get Sutton Cycling was not approached by either Sutton Council, or by the consultants, for any input during the production of the draft documentation. Whether the consultants have been provided with the council’s review of our ‘ward asks’ is not known. It is hoped that the draft cycling strategy will signal a new approach by the council, and that it will set the agenda for transformative changes in shaping transport in the borough. [iv] On a personal note, the recent announcement of the passing of Councillor Colin Hall on 30 March 2015 was received with great sadness and shock. I will remain extremely grateful to Colin for agreeing to meet and discuss the way forward for cycling advocacy last year. On behalf of all us at Get Sutton Cycling, and Sutton Living Streets, I would like to take this opportunity to send our condolences to Colin’s family and his close friends. Some wonderful tributes to Colin are detailed on the Sutton Liberal Democrats website, and also on the blogs of Councillor Mary Burstow and Councillor Jayne McCoy. Tributes given by Councillor Ruth Dombey and Councillor Tim Crowley can be read at Sutton Voice. From the few occasions that I met Colin, I will remember him as someone who was very approachable and considerate. From the tributes to him, it is clear that Colin’s untimely and premature death is a huge loss to Sutton and that he will be greatly missed. It was sad to learn that Cllr. Adrian Davey passed away on 24 November 2017 after a short illness. In a statement posted on the Sutton Liberal Democrats website, Council Leader Ruth Dombey said Adrian cared passionately about his ward and the people living there, and that he will be sadly missed. Adrian clearly had an interest in cycling, and in our campaigning. In May 2014, we were very pleased when Adrian came along to see our small ride to Cheam depart from Sutton town centre. At the Environment and Neighbourhood Committee meeting in November 2015, Adrian entered into the discussion leading up the approval of the borough’s Cycling Strategy (see Cycling Strategy receives approval!). Adrian said that he thought that the Cycling Strategy was an exciting piece of work, and that although there was someway to go it was a journey that we should all look forward to taking. He made the very valid point that working with neighbouring boroughs could help achieve efficiencies of scale. Added 01.12.2017.